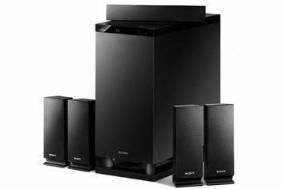 Sony launches HT-AS5 home cinema speaker system | What Hi-Fi? That means the PlayStation3 – or other Blu-ray player – can decode the HD audio and output in a format this system can understand. There's 3D pass-through on three HDMI inputs and one output, plus two optical and one coaxial digital input. The HDMI channel supports audio return, while there's also an FM/AM tuner and an auto calibration system. Available now, the Sony HT-AS5 looks set to sell for around £370.